This game product has its append patch pre-applied. Language selectable: English, Simplified Chinese and Traditional Chinese. Please note that this game product does NOT contain the Japanese version. Virgin Play: Can play through the entire game as a virgin. * Contains spoilers so be careful before looking!! 51: Taking a mayor's son's virginity! This product is written in English and Chinese. 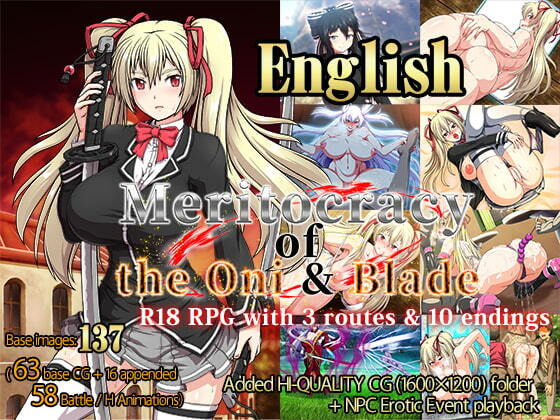 "Meritocracy of the Oni & Blade (RE215633)"
"Meritocracy of the Oni & Blade - Append (RE230257)"
"Meritocracy of the Oni & Blade [R-18 DLC for Steam Version] (RE234442)". - Correctly applied translated text where it had not been. - Fixed a display failure on the save / load screen. - Removed "Naked conversation" from H Experience.